The Sharpsville Area School District is committed to goals, strategies and action plans that will guide the District through the 2019 – 2022 school years. Comprehensive Planning facilitates communication and collaboration, promotes shared practices and resources, and ensures that every stakeholder is working toward common goals. To be effective and relevant, we believe it is critical that representatives from businesses in the area, community leaders, parents, school board members, and school staff all have opportunity to provide input and service on this committee. 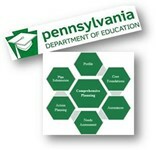 - Pennsylvania Department of Education (PDE).